While words cannot adequately express my sorrow to those who have been affected by the sexual abuse crises that our Church once again faces, I nonetheless want to extend my sincerest apologies and prayers for healing to these courageous and resilient survivors. As promised, I am releasing the names of clergy who have been the subject of a credible allegation of sexual abuse of a minor. I believe this is the best way in which to restore trust in the Catholic Church and its leadership - not just for the survivors, but for all people. I am committed to shining a light on the abuses of the past. I take the issue of sexual abuse of minors extremely seriously and feel the need for transparency and the protection of our children moving forward is of the utmost importance for the Church. I sadly have had the experience of dealing with the issue of trust, rebuilding it and finding a path to healing during my time as Bishop of the Diocese of Helena and before that, working in the Archdiocese of Seattle. I learned early on in my experiences that the way to begin down the road to healing is to acknowledge that we are talking about people’s lives and wounded hearts, hearts longing for healing and hope. We must first acknowledge the long patterns of protection, obfuscation, secrecy and concealment by bishops and the Church leaders and to create a system of accountability that includes the release of the names of Clergy against whom credible allegations have been made and to atone for this past behavior. For the Church, acknowledgement is the first step on a journey of healing, and after hearing poignant and heartbreaking stories of victim survivors, it is something I reflected on as a journey we need to take together with our people, especially with victim survivors. We must walk together in the company of the Lord Jesus, who mends shattered lives, and sets hearts free through his own amazing grace. Canon Law, the law that governs the church. Due to the size of the Diocese of Las Vegas and the history of the Diocese of Las Vegas’ inception as part of the Diocese of Reno and subsequently the Diocese of Reno-Las Vegas governing the entire state of Nevada, the process required travel, the copying and sharing of files as well as further investigatory work, and overall became quite a labor-intensive process. My direction was to include any and all members of Clergy who served at any time in the State of Nevada in our review process. Thereafter, all five members of the Review Board reviewed the clergy files of both the Diocese of Las Vegas as well as copies of the files provided to us by the Diocese of Reno. They met and discussed at length each of their opinions to arrive at their recommendations based on a set of criteria that the Review Board agreed would constitute a credible allegation. While the Review Board is a consultative board, I want to make clear that this is an independent board. Indeed, the Review Board is comprised of conscientious, highly-regarded, dedicated professionals with experiences and areas of expertise that uniquely qualify them as my advisors on these most significant matters. The Review Board includes local experts in law enforcement, medicine, and the legal profession – most of whom are parents. I am most grateful to them for their dedicated, challenging and continued service. With the exception of the Charter’s requirement that one pastor of the Diocese serve on the Review Board, none of the members are employees of the Diocese and they all volunteer their time in great service to our Diocese. The Review Board devised a protocol to ensure each clergy file was given the same objective attention and due diligence. Using a probable cause standard, an allegation was found credible where it had an indicia (indications) of reliability. In general, the publication of a name of a member of the clergy accused of sexual abuse of a minor was recommended for this list where the accused clergy: (a) resided or worked within the Diocese, and (b) was credibly accused, based upon the totality of the circumstances. It is important to note, however, that our own determination that an allegation was credible, does not necessarily mean that a crime was committed. The vast majority of the allegations determined as credible describe abuse that transpired prior to the implementation of the United States Catholic Conference of Bishop’s Charter for the Protection of Young People which was agreed to in 2002 and widely implemented in 2003. The list below identifies 26 clergy who, in the Diocese’s opinion, have been credibly accused of sexual abuse of a minor. We have gone to great lengths to ensure that this list is as exhaustive as possible. However, with the onset of technology, record keeping has become easier, more inclusive and complete in recent years. We recognize that there may be additional information that is not in our possession that may be relevant in our investigation and analysis of Clergy included on this list and others that are not included but may need to be based on information that may be forthcoming. We welcome any and all information for consideration and review. We know this will be an ongoing process and this list will be added to over time as we are able to review more information that may become available through the aforementioned process. Some of the names on the list may be recognizable as a result of a criminal conviction or other public report. Other names are being disclosed publicly for the first time. Some people on this list cannot be convicted of a crime because of the passage of time, legal technicalities, their present whereabouts or mental state, or other factors. Regardless, we are making a commitment to our community that the individuals on our list, and others we may learn about going forward, will not be accepted as employees or volunteers by this Diocese. They will not have faculties (the ability to minister) nor will they ever have faculties in the Diocese of Las Vegas. The Diocese of Las Vegas has instituted a number of measures and procedures in an effort to safeguard the young people of our church. To that end, the Diocese of Las Vegas requires that all its volunteers and employees undergo background checks through fingerprinting. These fingerprints are processed through both the repository for the State of Nevada as well as through the Federal Bureau of Investigation. The results of these background checks are reviewed by the Diocesan Director of Security, a former high-ranking member of law enforcement. Additionally, the Diocese trains over 1,500 employees and volunteers (on an annual basis), to educate our people in preventing and detecting child abuse. Further, an average of 17,000 children in our schools and religious education classes are instructed on how to report any uncomfortable or inappropriate behavior by another individual towards them or their friends. All incidents of child sexual abuse are immediately reported to law enforcement and the Diocese of Las Vegas cooperates fully in any ensuing investigations. Each year, the Diocese of Las Vegas voluntarily submits to an audit verifying its compliance with the Charter for Protection of Young People as amended by the United States Conference of Catholic Bishops (“Charter”). As I have said previously, all members of the Church, lay and ordained, need to educate themselves about the sexual abuse of minors, educate themselves, weed out alibis and denials, and embrace the truth of this twofold scandal to help heal the abused children, now living as wounded adults. In the name of the Diocese of Las Vegas, I pledge to all of you that we will be vigilant, transparent and intolerant of abuse. I thank victim survivors for their courage in stepping forward to help to shed light and truth on one of the darkest chapters in the Church’s history. Most Reverend George Leo Thomas, Ph.D. If you have information or knowledge of allegations of sexual abuse against clergy within the Diocese of Las Vegas, please contact Mr. Ron Vallance, Victim Assistance and Safe Environment Coordinator at 702-235-7723. On August 22, 2018, The Most Reverend George Leo Thomas, Ph.D., proposed to the Diocesan Clergy Oversight Review Board/Independent Review Board (“Review Board”) the publication of names of Clergy who have had past credible complaints of sexual abuse against minors. The Diocese of Las Vegas is the larger of the two Nevada dioceses. Therefore, the publication process was labor intensive, and in some instances individual cases required additional investigation. Note: Some of the names on the list of the Diocese of Las Vegas are also listed on the Diocese of Reno’s list due to the fact that the Dioceses were once a singular or combined entity. The first Catholic Diocese in the State of Nevada, the Diocese of Reno, was founded in 1931. In 1977, the name was officially changed to the Diocese of Reno-Las Vegas in recognition of the growth in the Las Vegas valley. In 1995, the Diocese of Reno-Las Vegas was divided into two separate Dioceses: the Diocese of Reno in the north and the Diocese of Las Vegas in the south. Pursuant to the Charter for Protection of Children and Young People (“Charter”), promulgated by the United States Conference of Catholic Bishops in 2002, the Bishop of Las Vegas created a Clergy Oversight Board (Review Board). This board includes local experts in law enforcement, medicine, the legal profession, and one representative of the Clergy. The following individuals comprise the current Review Board: David Roger, Esq., (Chairperson); Sharon Carelli, BSN, RN, MPS; Fr. Gerald Grupczynski, S.Chr. ; Rita Kerzetski; and James Silvestri, Esq. The board reviews allegations against Clergy, including allegations of sexual abuse committed against minors, and makes recommendations to the Bishop regarding the accused Clergy’s continued service in the Diocese of Las Vegas. With the exception of the Charter’s requirement that one pastor of the Diocese serve on the Review Board, all of the members are lay people and are not employed by the Diocese. WHAT WAS REVIEWED TO COMPILE THE LIST? Bishop Thomas provided unfettered access of Clergy files to the Review Board for an in-depth, coordinated review of all available files. This included the Review Board’s access to Clergy files maintained within the Bishop’s secure archives which are maintained in accordance with Canon Law. The Diocese has gone to great lengths to ensure that this list is as exhaustive as possible. Additionally, based upon the combined nature of the Diocese prior to 1995, the Diocese of Reno identified files that it felt our Review Board should examine. With the onset of technology, record keeping has become easier, more inclusive and complete in recent years. We recognize that there may be additional information not currently in our possession and we welcome any new or additional information for consideration and review. With the evaluation of any additional information, this list may be updated in the future. The process of compiling information for the purpose of creating a list was commenced when former District Attorney for Clark County, Mr. David Roger, as well as legal counsel for the Diocese of Las Vegas, travelled to Reno to undertake a review of the Clergy files made available by the Diocese of Reno. At the time the Diocese was divided in 1995, many of the Clergy files were retained (and continue to be maintained by) the Diocese of Reno; some files were transferred to Las Vegas. Some of the file materials provided date back eighty years. Per our request, the Diocese of Reno copied these files and provided them to the Diocese of Las Vegas. Thereafter, all members of the Diocese of Las Vegas’ Review Board reviewed the Reno Clergy files as well as Clergy files of the Diocese of Las Vegas. The Review Board met several times to weigh the credibility of the accusations based upon established criteria, and to make recommendations to the Bishop. The Review Board will continue to evaluate all information as it is received and this list of names may be updated or expanded at a future date. WHAT CONSTITUTES A CREDIBLE ALLEGATION? The Review Board, chaired by Mr. David Roger, Esq., developed the criteria used in evaluating the individual files to ensure each Clergy file was given the same objective attention and due diligence. Using a probable cause standard, an allegation was found credible where it had an indicia (indications) of reliability. Considering the totality of the circumstances, various factors were considered, including: timing of the complaint and whether it coincided with the Clergy’s assignment; context and circumstances surrounding the allegation; whether there was any corroboration (e.g., similar allegations by others, statements, witness accounts, other writings, etc. ); whether criminal or civil prosecution was undertaken; whether the Clergy admitted to the sexual abuse; and whether a settlement was entered into with a victim, as well as the credibility of all the facts and information presented from all sources. This standard is consistent with Bishop Thomas’ philosophy of transparency and the right of the public to be informed. The Diocese is committed to carefully guarding due process for all parties. 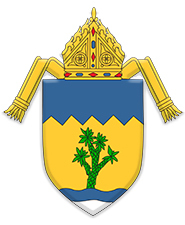 The list provided by the Diocese of Las Vegas includes names of Clergy who have served in any capacity in any Diocese within the State of Nevada. For the purpose of this list, the term “Clergy” includes: priests (both those ordained for the Dioceses of Nevada, as well as those from other dioceses serving here) as well as deacons, brothers, and seminarians. Some Clergy were listed with a notation that they were included because of credible allegations made in another Diocese. Even though the Diocese of Las Vegas did not have access to all such information, it was the directive of Bishop Thomas that all Clergy – who served at any time within the Nevada Dioceses – be named on the list regardless of the jurisdiction in which alleged abuse occurred. IS ANYONE ON THIS LIST STILL SERVING IN ANY OF OUR PARISHES OR SCHOOLS? HOW DOES THE DIOCESE OF LAS VEGAS HANDLE ACCUSATIONS OF SEXUAL MISCONDUCT TODAY? Once the Bishop is made aware of an allegation of sexual abuse of a minor, whether an old or new allegation, the accused Cleric is immediately placed on administrative leave and is ineligible to serve in our Diocese while the investigation and review takes place. All allegations of sexual abuse of a minor are reported to the Victim’s Advocate of the Diocese of Las Vegas and immediately reported to law enforcement (pursuant to Nevada law and Diocesan procedures). When permitted by local law enforcement, the Diocese of Las Vegas commences its own internal investigation. Outreach is provided to the victim, including an offer of both spiritual support and professional counseling services. If a priest is found guilty of sexual abuse following a legal and/or canonical processes, the Diocese enforces a zero tolerance policy in accord with policies established by the United States Conference of Catholic Bishops. WHAT SAFEGUARDS HAS THE DIOCESE OF LAS VEGAS IMPLEMENTED? The Diocese of Las Vegas has instituted a number of measures and procedures in an effort to safeguard the young people of our Church. To that end, the Diocese of Las Vegas requires that all of its volunteers and employees undergo criminal background checks including fingerprinting. Fingerprints are processed through both the repository for the State of Nevada as well as through the Federal Bureau of Investigation – a practice that exceeds the standards established by the Charter. The results of these background checks are reviewed by the Diocesan Director of Security, a former high-ranking member of law enforcement. Since 2003, the Diocese of Las Vegas has processed approximately 24,500 sets of fingerprints. All parishes, missions and schools in the Diocese of Las Vegas comply with the Safe Environment Program. On average the Diocese of Las Vegas trains annually about 1,500 employees and volunteers, including Clergy, to recognize the signs of abuse and how to report these suspicions to both law enforcement and the Diocese. Additionally, the Diocese provides this training to approximately 17,000 children (both students in our schools and children enrolled in our religious education classes) each year. This training is to help children identify inappropriate behavior in adults and report such behavior to those people they consider to be safe adults in their life (such as parents, etc.). Each year the Diocese of Las Vegas voluntarily submits to an audit (conducted by a nationally recognized audit firm) verifying its compliance with the Charter and its Safe Environment Program. In 2003, the Diocese created the position of the Victim’s Assistance Coordinator/Victim’s Advocate, consistent with the Charter. The Victim’s Assistance Coordinator/Victim’s Advocate, as the first point of contact, is the face of the Church’s response to victims of sexual abuse by a Church worker (Clergy, lay employee or volunteer). He helps victims in their recovery and reconciliation. Anyone who has been sexually abused by a Church worker should contact law enforcement and Victim’s Assistance Coordinator/Victim’s Advocate, Mr. Ron Vallance, at (702) 235-7723 or by email at assistmin@dolv.org. Inclusion on this list is based upon complaints brought forward to the Diocese of Brooklyn as well as complaints brought forward to the Diocese of Las Vegas. Inclusion on this list is based upon complaints brought forward in the Diocese of Louisville; Based upon a review of available records, there were no complaints against Fr. Bowling of sexual abuse of a minor while working within the Nevada Dioceses. Inclusion on this list is based upon complaints brought forward in other Dioceses; Based upon a review of available records, there were no complaints against Richard Emerson of sexual abuse of a minor while working within the Nevada Dioceses. Inclusion on this list is based upon complaints brought forward to the Grand Jury in the Eastern District of Pennsylvania. Based upon a review of available records, there were no complaints against Fr. Paone while working within the Nevada Dioceses. Inclusion on this list is based upon complaints brought forward in other Dioceses; Based upon a review of available records there were no complaints against Fr. Porter of sexual abuse of a minor while working within the Nevada Dioceses. Inclusion on this list is based upon complaints brought forward to the Diocese of Sioux City; Based upon a review of available records there were no complaints against Fr. Stapenhorst of sexual abuse of a minor while working within the Nevada Dioceses. Inclusion on this list is based upon complaints brought forward to the Viatorian Order in Illinois; Based upon a review of available records, there were no complaints against Br. Dodd of sexual abuse of a minor while working within the Nevada Dioceses. Inclusion on this list is based upon complaints brought forward in the Diocese of Louisville; Based upon a review of available records, there were no complaints against Fr. Devlin of sexual abuse of a minor while working within the Nevada Dioceses. Fr. Theodore Feely, O.F.M. Conv. Inclusion on this list is based upon complaints brought forward in the Diocese of Rockford; Based upon a review of available records, there were no complaints against Fr. Feely of sexual abuse of a minor while working within the Nevada Dioceses. Inclusion on this list is based upon complaints brought forward in other Dioceses; Based upon a review of available records, there were no complaints against Fr. Horvath of sexual abuse of a minor while working within the Nevada Dioceses. Inclusion on this list is based upon complaints brought forward in other Dioceses; Based upon a review of available records, there were no complaints against Fr. Ladenburger of sexual abuse of a minor while working within the Nevada Dioceses. Fr. Andrew Manetta, O.F.M. Cap. Inclusion on this list is based upon complaints brought forward in other Dioceses; Based upon a review of available records, there were no complaints against Fr. Manetta of sexual abuse of a minor while working within the Nevada Dioceses. A canonical process will be initiated by the Diocese of Reno to determine Brother Napolitano’s guilt; at its conclusion, the results will be made public. Missouri; Based upon a review of available records, there were no complaints against Bede Parry while working within the Nevada Dioceses. community of sisters where he was in residence. Clergy includes priests, deacons, brothers and other religious men. It also includes religious order priests, deacons, and brothers. A copy of the Charter can be viewed at: http://www.usccb.org/issues-and-action/child-and-youth-protection/charter.cfm. A copy of the Charter can be viewed at http://www.usccb.org/issues-and-action/child-and-youth-protection/charter.cfm. This list includes Clergy who were part of the Diocese of Reno-Las Vegas prior to the 1995 split which divided the Diocese of Reno-Las Vegas into two separate Dioceses - the Diocese of Las Vegas and the Diocese of Reno. As a result, some of those named here also appear on the list of the Diocese of Reno. For the purpose of this list, the term “Clergy” includes priests, deacons, brothers and other religious men as well as religious order priests, deacons and brothers. January 2001. However, Bishop Yanta granted Fr. Horvath limited faculties to care for the sacramental needs of a religious community of sisters where he was in residence.